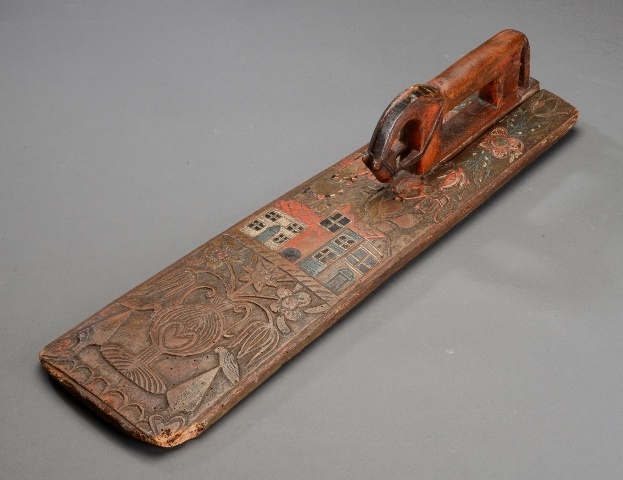 The mangle board (sometimes called mangling board or smoothing board) is one of the most poignant and interesting objects of folk art, particularly but not exclusively Scandinavian folk art. 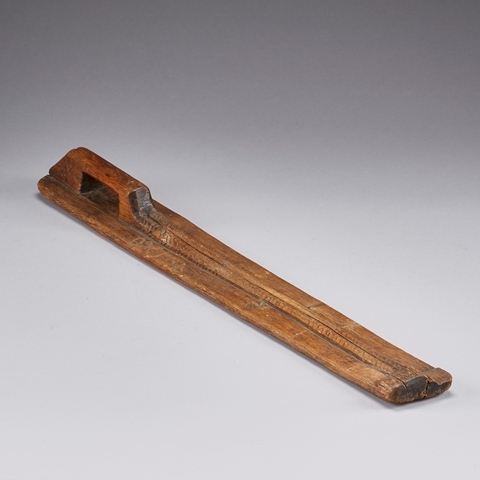 An ancestor of the iron and cousin of the laundry bat, this old domestic implement was used to press or smooth laundry, i.e., to remove the folds after washing. The mangle board was a single piece of carved wood (usually oak, beech or pine), used in conjunction with a kind of rolling pin around which a damp material (towel, cloth, sheet, etc.) was tightly rolled. The person using the mangle board held the handle with her dominant hand, with the other hand placed flat near the end of the board. The mangle board was then moved over the rolling pin in a back and forth movement, thereby smoothing the fabric. It is difficult to locate the origin of the mangle board with exactitude, but its use seems to have been made widespread by the Vikings in the coastal regions of Northern Europe. 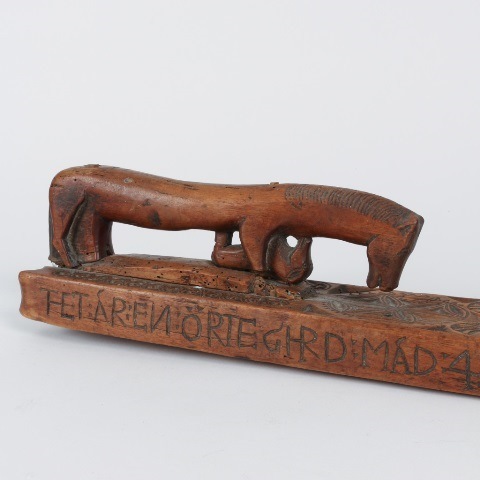 The oldest known model is a Norwegian board, found near Bergen and dated 14441. All mangle boards predating the 1600s are characterized by their simple shape, discreet ornamentation and the absence of a figurative (or carved) handle, and paintwork. This sobriety and uniformity suggest that at that time, the boards were merely domestic tools with a utilitarian purpose only. 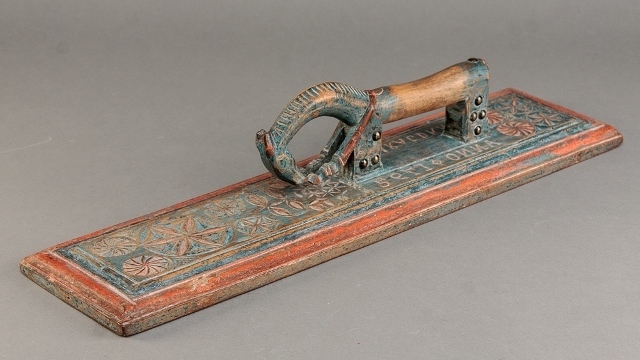 It was in the 17th century that mangle boards decorated with sculptures in bas-relief or high relief - and possibly painted with one to three colours - appeared. 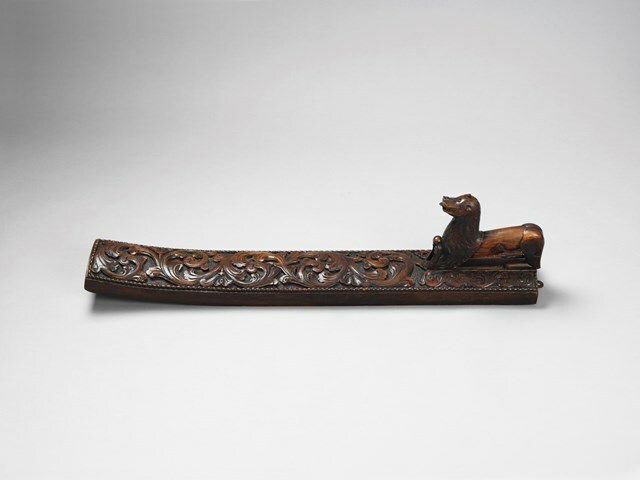 In contrast to their initial minimalism, the handle was carved in the shape of a horse, a mermaid or a lion, in either a realistic or stylized fashion, sometimes even abstract or baroque2. 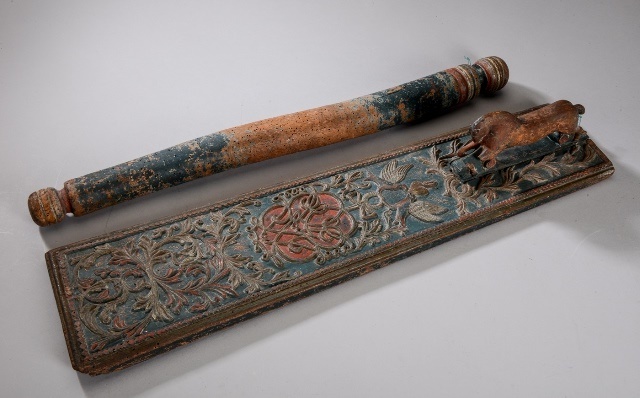 As early as 1610, decorated mangle boards became widespread and adopted a particular style, shape and ornamentation specific to their region of production. Woodworkers created the boards in their workshops, copying the same model on an artisan scale, modifying only the colours used and the arrangement of the motifs. 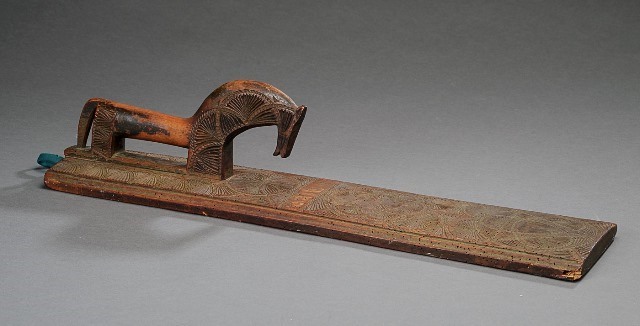 Many mangle boards were also made by amateurs—the quality and creativity of the carvings therefore varied in accordance with their artistic ability. Obviously, this sudden interest in aesthetics reveals a change in meaning. The mangle board, while remaining a functional object, became a courtship gift offered by the man to his bride-to-be prior to the wedding day. The beauty and quality of the mangle board were a symbol of the future husband’s means. In some regions, legend has it that the mangle board was used to make a wedding proposal official. The suitor hung the board on the door of the house where the woman he wished to marry lived; if the board remained on the door, his proposal was rejected. The rejected suitor could not then offer that board to another woman. This may explain why some mangle boards do not have initials (usually three) or dates (the year of the marriage) on them and why the spaces provided for this purpose have remained blank. The production of mangle boards reached its peak at the end of the 18th century, when regional styles were so firmly established that it was possible to identify the geographical origin of a board with great certainty. These treens were common across Europe, from Alsace (France) to Russia, including the Netherlands, Germany, Denmark, Sweden, Norway, Iceland, Finland, the British Isles, and to a lesser extent, in a handful of countries in Central and Eastern Europe. Around 1860, the number of mangling boards decreased considerably and their style became rather decadent, a sign that they had lost their symbolic meaning and therefore, their importance. The motifs or ornamentation were repeated in a mechanical fashion with a preference for symmetrical designs; the carvings disappeared in favour of painting and the resulting boards were much less creative in appearance and design. 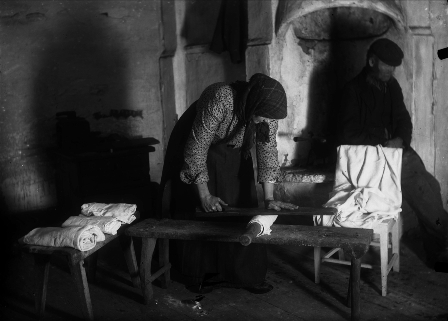 Although they continued to be used by some women up until 1950, mangle boards had become a remnant of the past. This marvellous handicraft is now extinct. 1 Housed at the Norsk Folkemuseum in Oslo, Inv. No. : NM.0049693. 2 With the exception of Dutch mangling boards (generally produced in the province of Friesland) that were without a figurative handle.